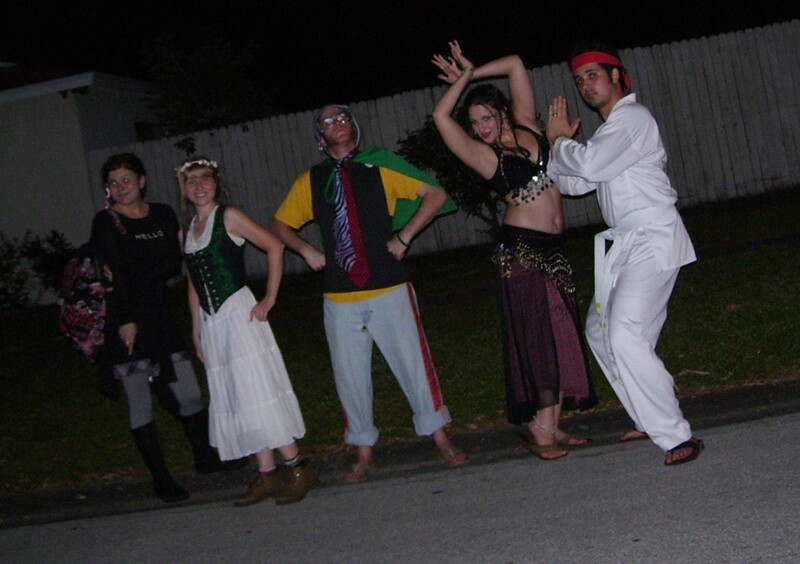 Halloween 2009--Trick-or-treating and PARTY! A ton of people came because it was a Saturday this year! 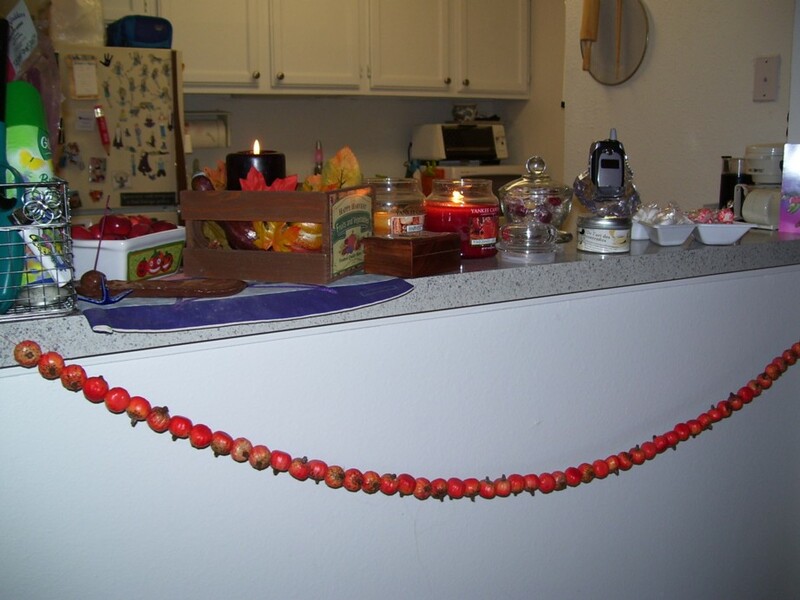 samhain09garland.jpg: Here is my pumpkin garland and some candles lit for enhancing the mood. 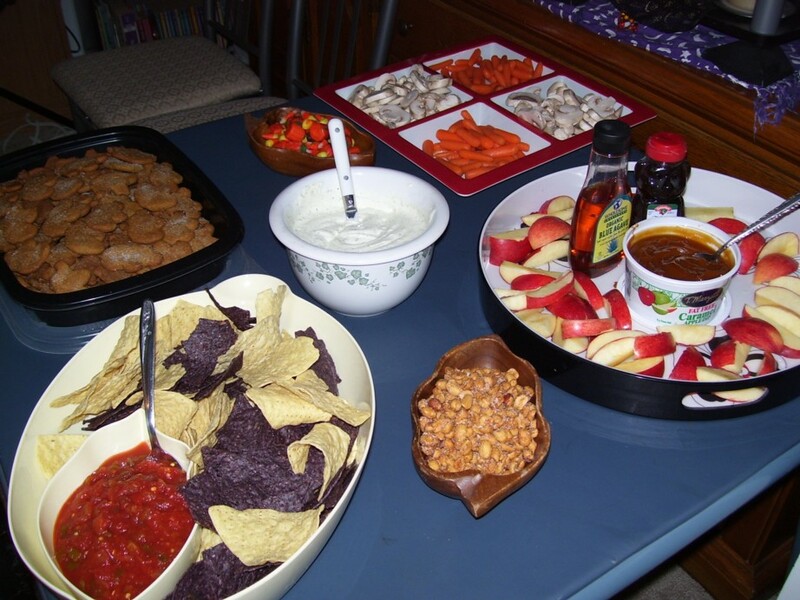 tizers.jpg: This is what the appetizer table looked like, to hold people over until it was time for dinner. 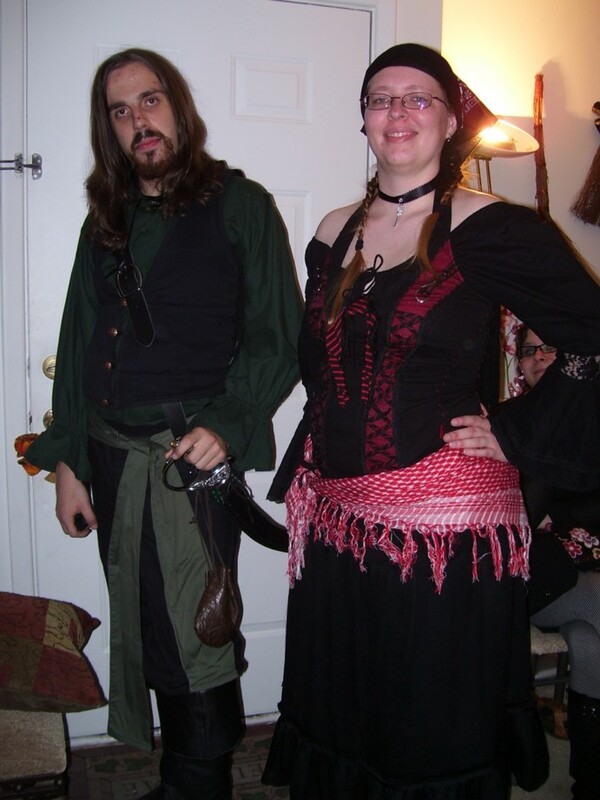 earlyarrivals.jpg: Here are some of my earlier arrivals. 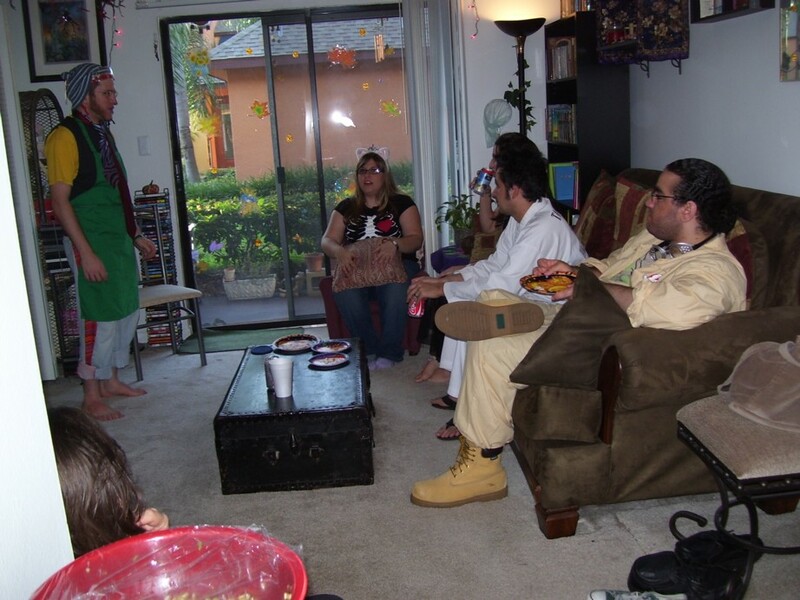 Avi, Stephanie, Heather, Amin, and Derek, plus the back of Gary's head. 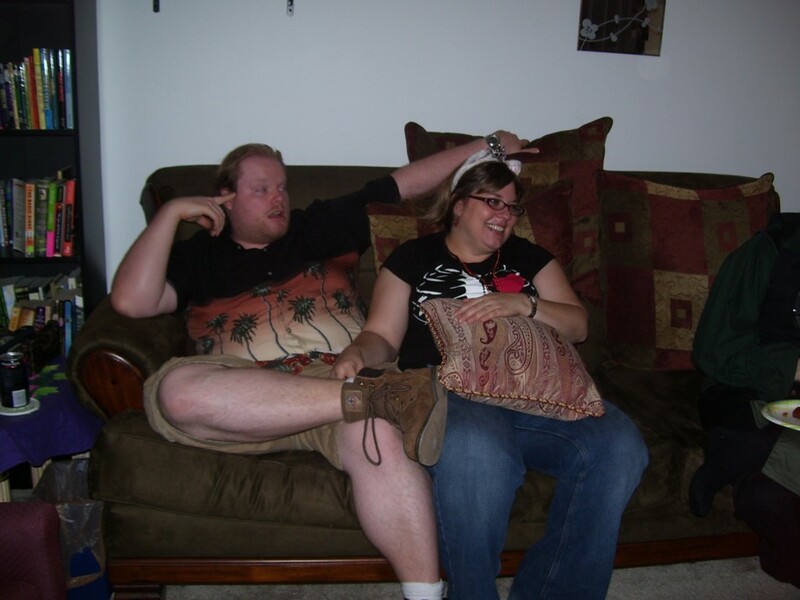 gypsyinasmallchair.jpg: Heather had no problem sitting in my teeny chair, see? eatingdinner.jpg: Food consumption was next on the agenda. 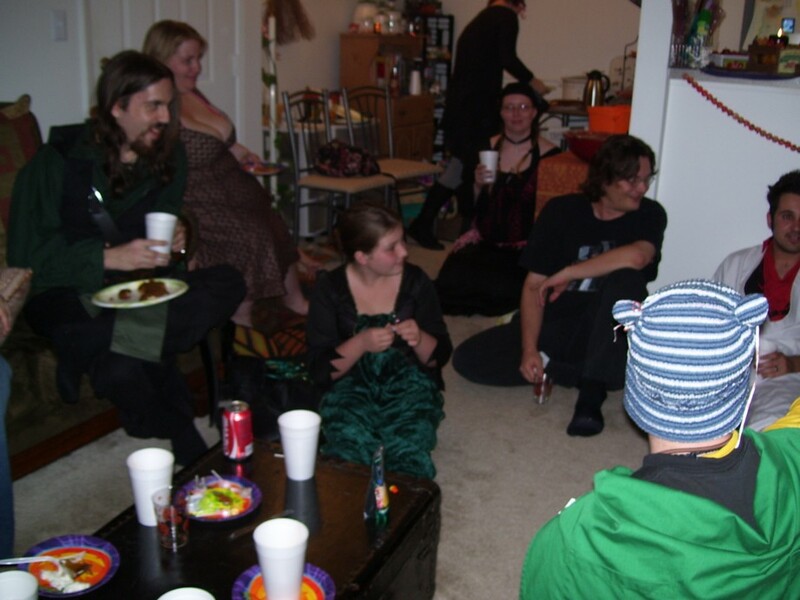 You can see Jeaux here, next to Avi, and the back of Stephanie's head. 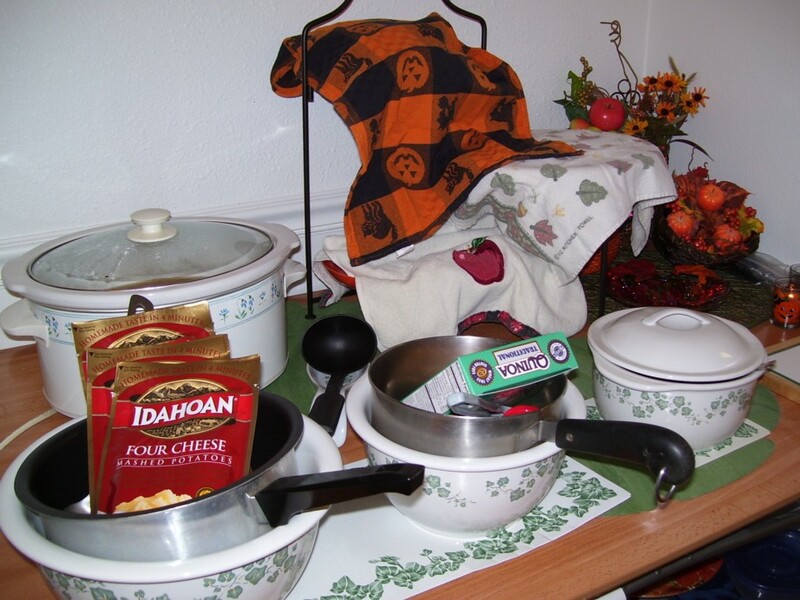 They were consuming such yummies as baked macaroni and cheese, mashed potatoes, corn, tater tots, bean casserole, banana/pumpkin/cranberry muffins, chicken, and quinoa. 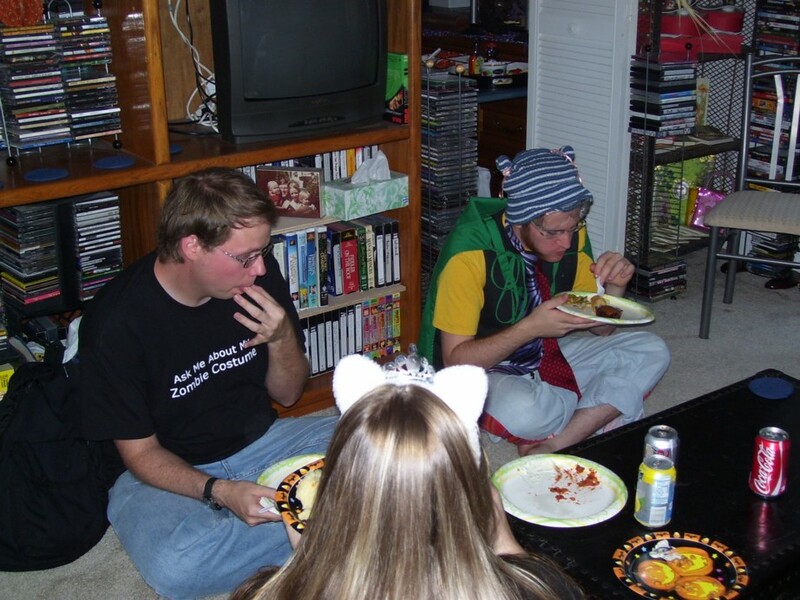 ahhfloor.jpg: The floor is not the most comfortable dinner-eating place, but my guests didn't seem to mind. 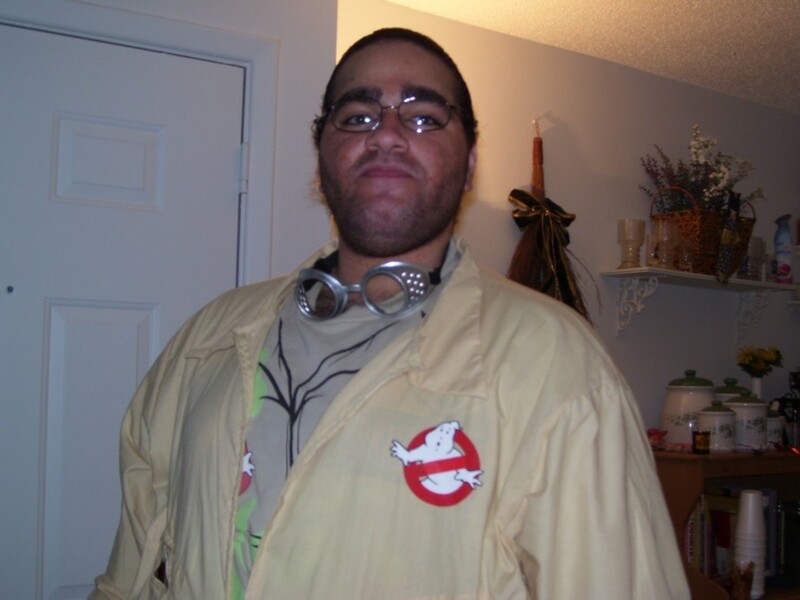 ghostbuster1.jpg: I tried to get a good picture of Derek's costume, but he is so tall and I am so short! 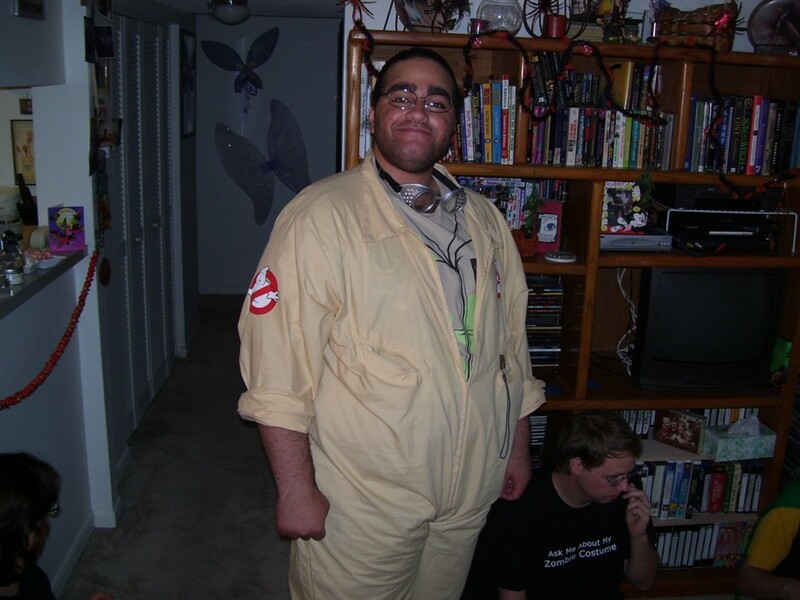 So. . . .
ghostbuster2.jpg: . . . I stood on the footstool to get a better angle of him. 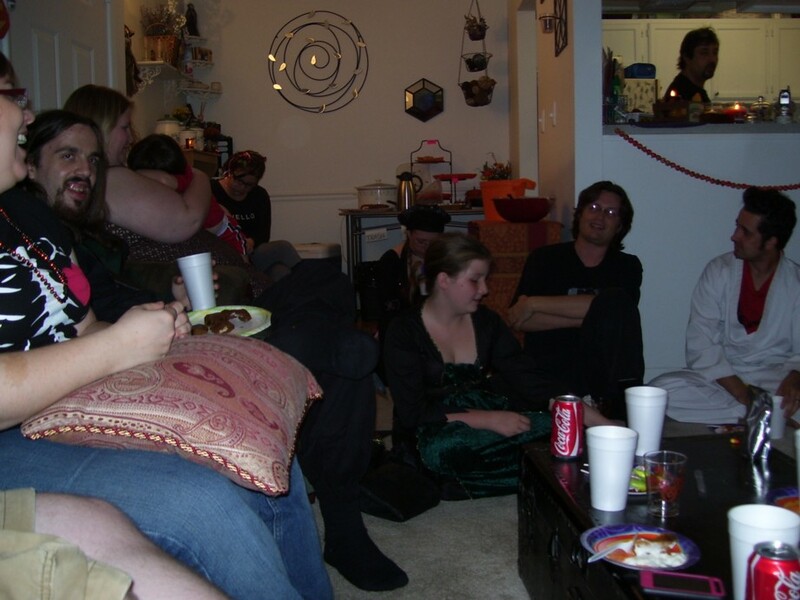 couchies.jpg: There were so many people that they had difficulty finding places to sit. 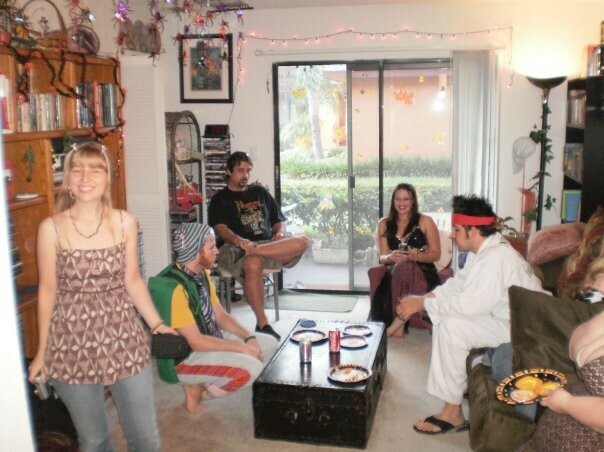 Stephanie, Michael, and Meghan are in this picture. Eating dinner! 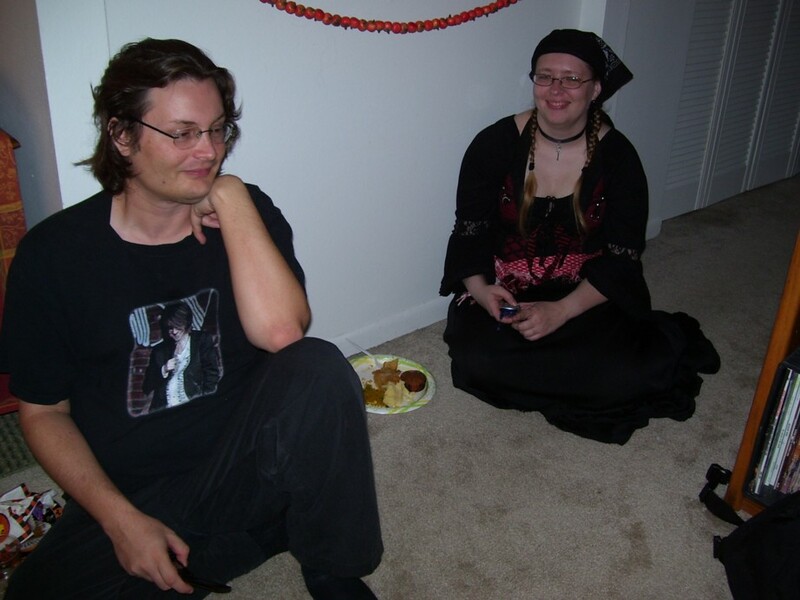 garykit.jpg: It's Gary and Kit, my floor-sitters. 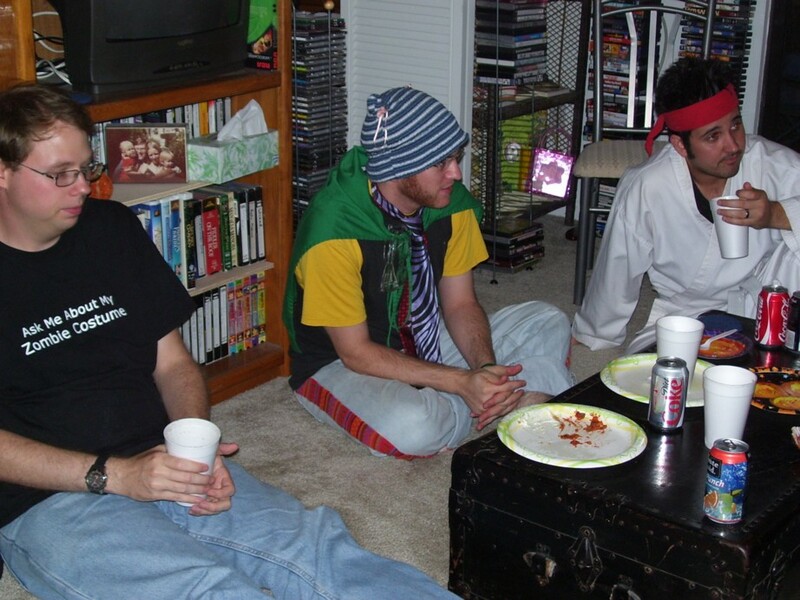 I believe they mostly remained in those positions the entire night. derekgogoavi.jpg: Derek took a similar picture of Avi, and he did the same thing! 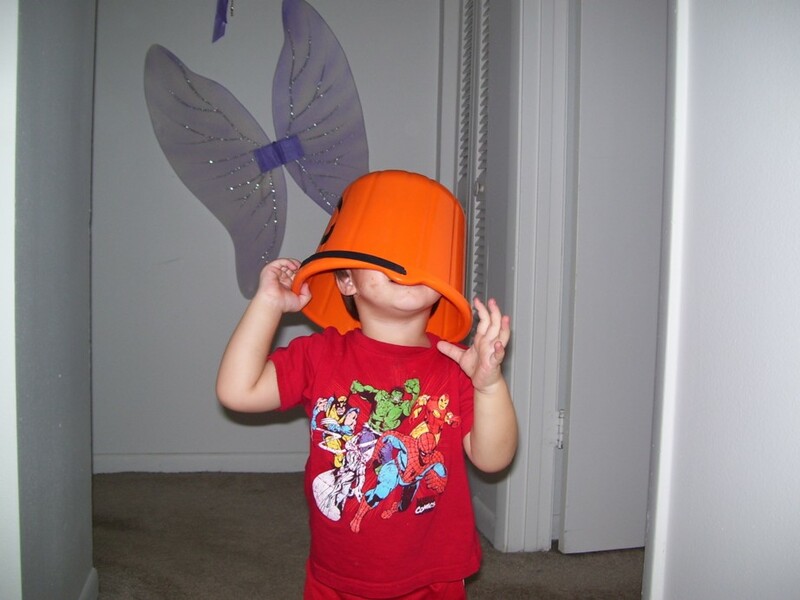 benbuckethead1.jpg: Toddler Ben was also in attendance. 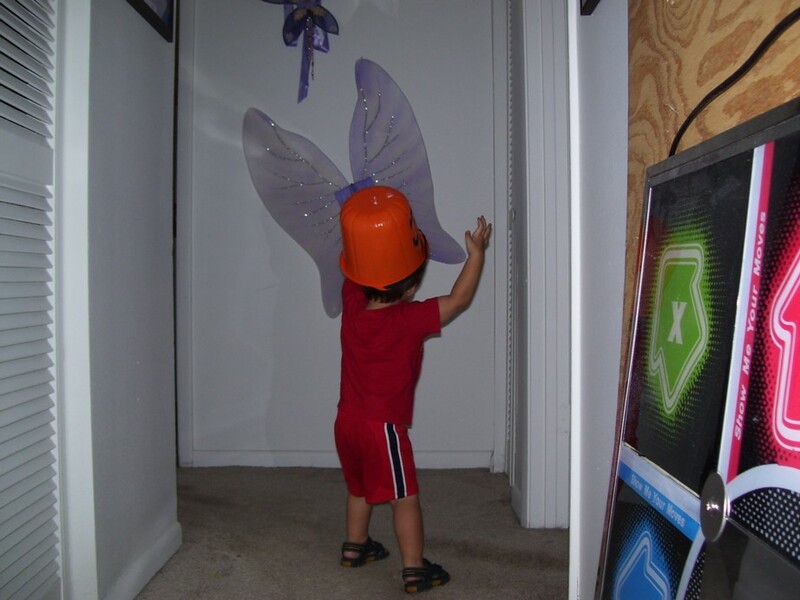 He put his trick-or-treat bucket on his head. 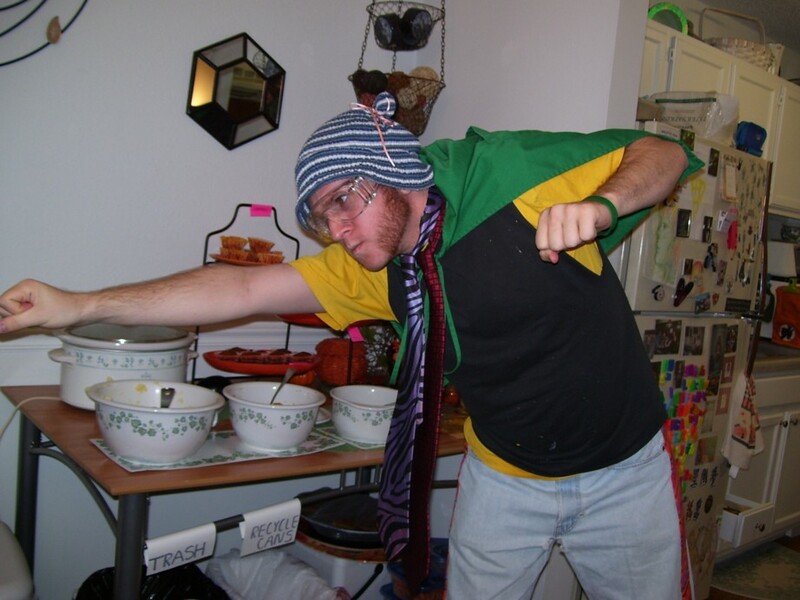 benbuckethead2.jpg: See? He's peeking out under there. derekheathergypsy.jpg: Heather struck a pose for Derek's camera. derekivyghostbuster.jpg: Before Derek left, we had to get a photo together. 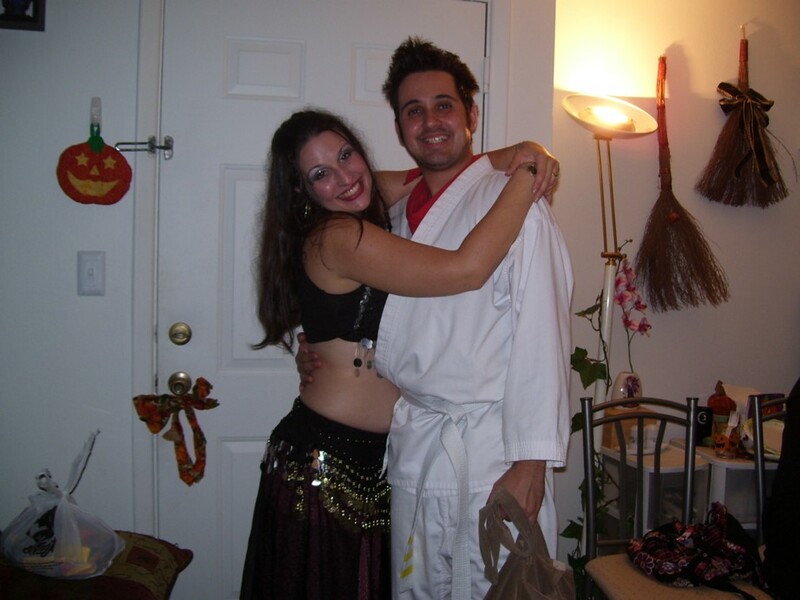 (This was the first time we met in person!) This is from his camera. 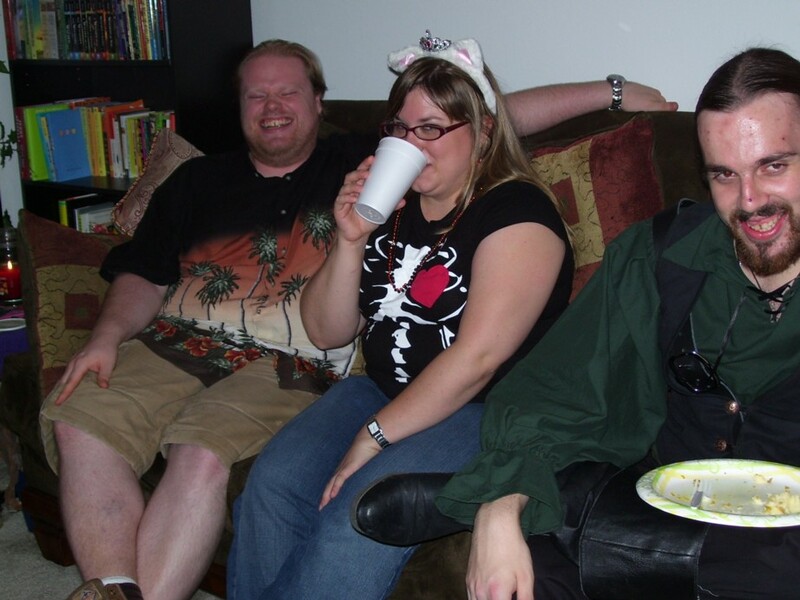 laughanddrink.jpg: Eric finally arrived, and here he is with Stephanie and Michael. 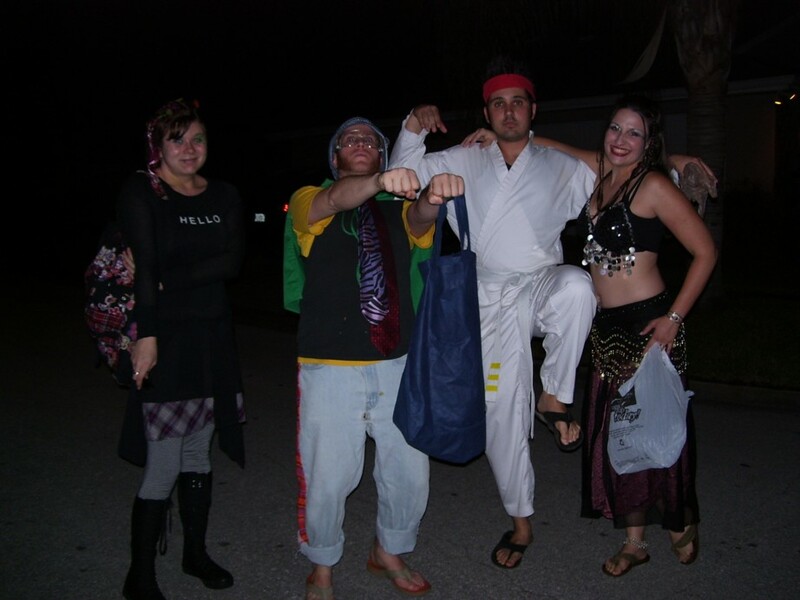 smalltrickortreatgroup.jpg: Adrienne, Avi, Amin, and Heather are doing their thing while about to start trick-or-treating! 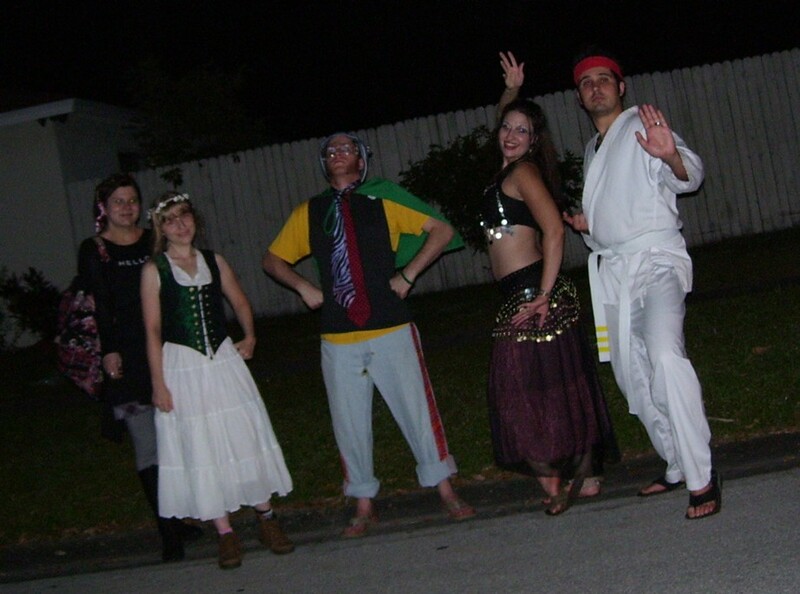 allfivetrickortreat1.jpg: And here's after the trick-or-treating was over, with all five of us. Can you believe one house gave some of us beer?? 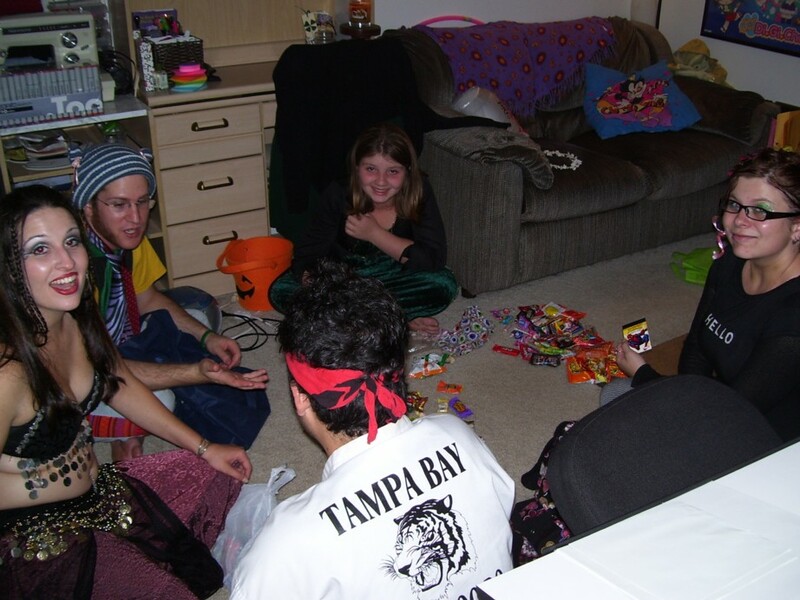 candytraders1.jpg: After we got back, Katelyn had joined the party after trick-or-treating herself. So we all got to share candy. 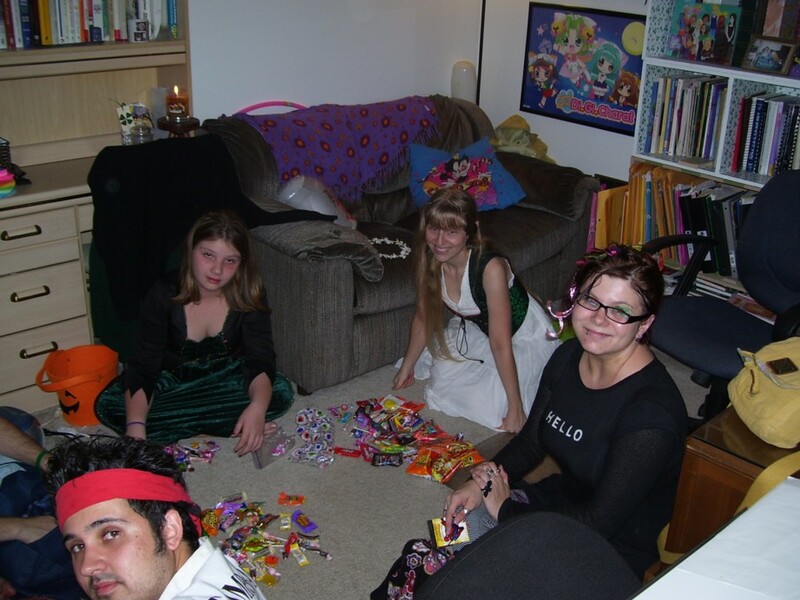 candytraders2.jpg: I'm in the picture now too. Gary's taking this one. 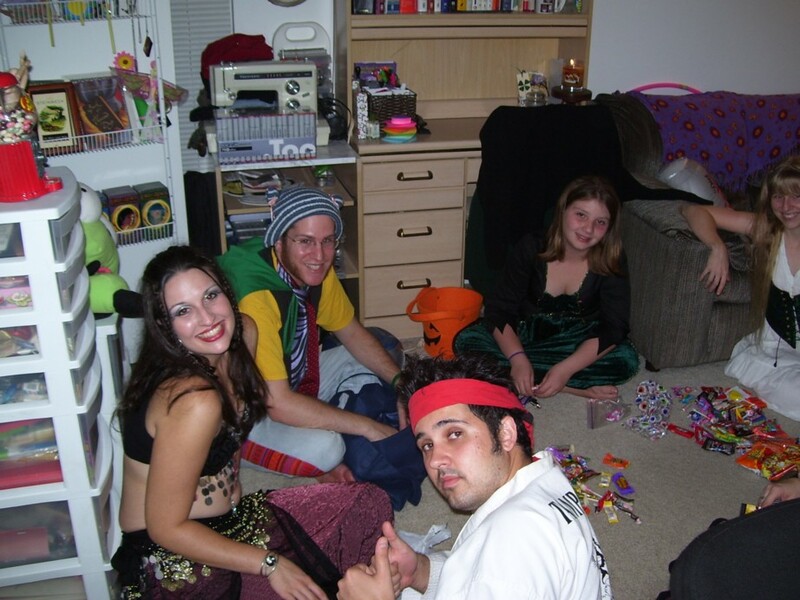 candytraders3.jpg: No trick-or-treating ritual is complete without dumping candy everywhere and leaving choice costume parts all over the room. crowded.jpg: Sorry, guys, I know my apartment is small. 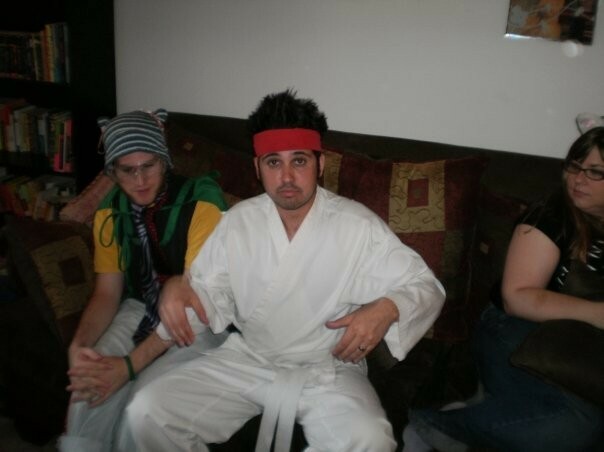 :) Gosh, I can see Avi, Katelyn, Michael, Meghan, Gary, Amin, Kit, and Adrienne way in the back. ericseemstired.jpg: I didn't get many photos of Eric, but he seemed to be making a strange face in most of them. Which is different from his usual on-purpose strange faces. Perhaps he was too tired to laugh at whatever's amusing Stephanie here. 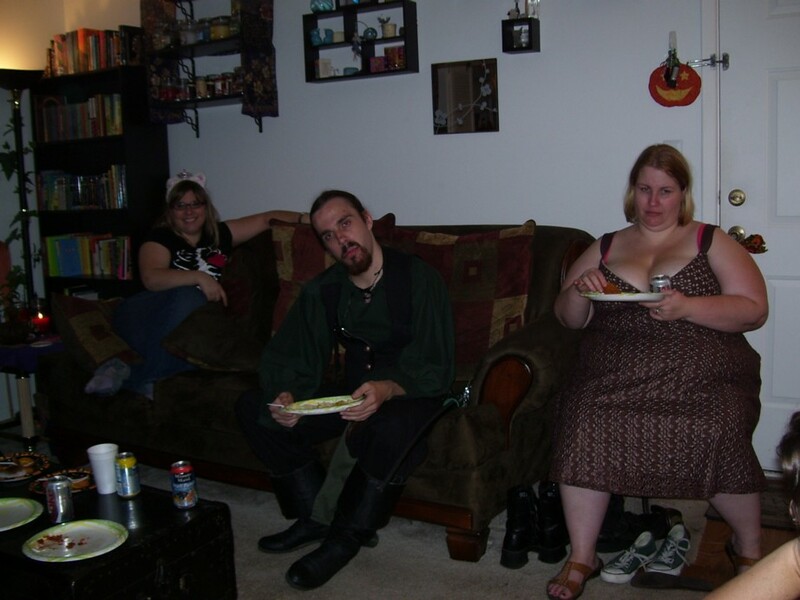 heatherthepimp.jpg: In the latter stages of the party, I had a few new guests. This is Heather. 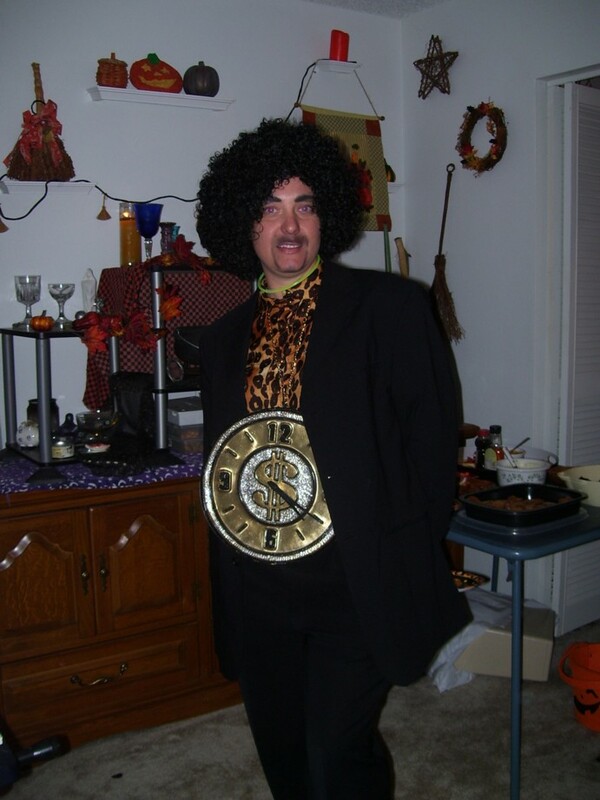 She's dressed as a pimp. mattthebitch.jpg: Matt, Heather's husband, appears to be filling the role of one of Heather's, erm, women. 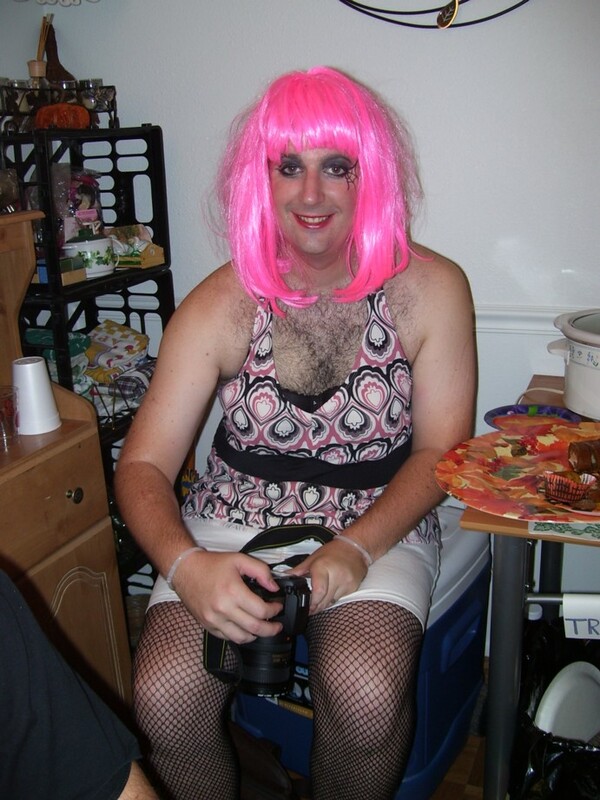 Guys in drag often still sit with their legs open. Heh. michaelkit.jpg: Before Michael and Kit left I had them pose too. I gave them some stuff to take home to Jef and Anita, who couldn't come due to health issues. 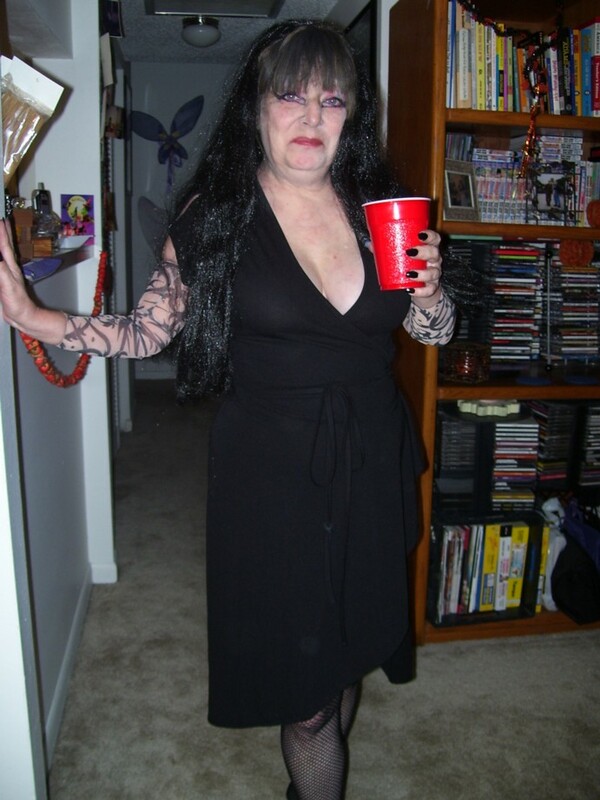 momelvira.jpg: And my famous mother. As Elvira. My God. Some other people might've gotten pictures they'll let me put here later, but these are all the ones taken with my camera. :) After everyone left, I cleaned up, and pretty much as soon as I was done Derek the Ghostbuster came back! So he got some pie and we hung out. Sadly after he left I got really sick and threw up all the good food. I don't know why. Nobody else seems to have gotten sick, so I blame the cinnamon. . . .